Uma das novas tendências deste Outono/Inverno é as peças em pele. Eu gosto de vestir peças com detalhes em pele mais do que uma peça inteira com este tecido. Andava eu a ver o episódio da semana passada das Pretty Little Liars e fiquei in-love com com casaco de ganga com mangas de pele da Emily Fields! Para quem não gosta de vestir calças de ganga com casacos também de ganga (como eu) acho que com este detalhe das mangas pode mudar totalmente o look. É um tipo de casaco que fica bem para todas as estações do ano: nos dias mais frios conjugado com uma camisola mais quente e nas noites frias de Verão, pois não é um casaco pesado e muito quente. A famous trend for this Fall/ Winter was leather pieces. I like to wear pieces with some leather details more than a complete piece with this fabric. 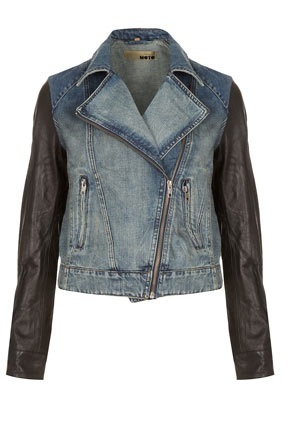 Some days ago i was watching the Tv Show Pretty Little Liars and i fell in love with Emily Field's Denim jacket with leather sleeves! If you don't like to wear denim jackets with jeans (like me) i guess this kind of style is so much better to wear with jeans, it totally changes the outfit! This kind of jacket is great to wear on cold days with a cozy sweater or on those cold summer nights, cause it is not too heavy. 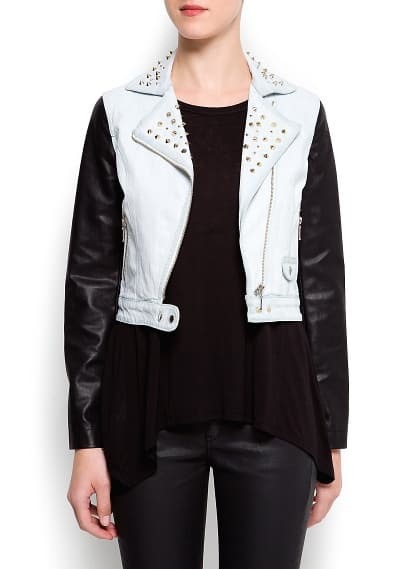 I was looking for these jackets and i found some great ones! So where can you find it?